Posted February 2, 2014, in Student Alumni. Curtis Williams was a doctoral student in Public Affairs and Community Development. He earned a BA in History and African-American Studies from Rutgers-Camden in 2007 and MA in Humanities and Social Thought from New York University in 2009. Prior to coming back to Rutgers, he worked on Joint Base McGuire Dix Lakehurst with Child and Youth Programs. He was also an adjunct history instructor at Burlington County College. 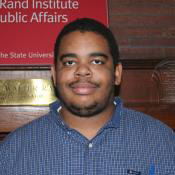 His master’s thesis at NYU was entitled “Voices of Protest: Analyzing Controversial Speech in the Black Public Sphere.” He has a wide variety of research interests, including black political discourse, education, and community development. Page last updated by Senator Walter Rand Institute for Public Affairs at 12:46 pm August 2, 2016 . This page was printed from http://rand.camden.rutgers.edu/2014/02/02/williams-curtis/ at 4:05 PM Monday, April 22, 2019.